These lovely seasonal recipes were posted on our farmshare’s website. Any of these delicious items can be converted into vegetarian options with a few simple variations. Enjoy! Bake peppers uncovered until tops are browned and thermometer inserted into filling registers 165°F, about 1 hour. Transfer peppers to platter. Garnish with rosemary sprigs and serve. Preheat oven to 350°F with rack in middle. Butter a 2-quart shallow ceramic or glass baking dish. crumbs. Increase oven temperature to 450°F. crumbs, stirring frequently, until golden, 4 to 5 minutes. Season with salt and pepper. Spoon evenly over tomatoes. sprinkle with remaining 1/4 tablespoon thyme. with foil and roast until beets are tender, about 45 minutes. Cool; peel. Place 9- or 10-inch-diameter cast-iron skillet in oven; preheat to 400°F. Whisk first 5 ingredients in medium bowl. made 1 day ahead. Cover; store at room temperature. Add enough water to small saucepan to measure 11/2 inches; bring to boil. Add orange peel. Blanch 1 minute; drain. until browned, about 5 minutes longer. prepared baking sheet. Top with another sheet of parchment paper, then another rimmed baking sheet to press ham. paper. Cool. Break ham into bite-size pieces. of remaining vinaigrette and aged balsamic vinegar. This is a wonderful recipe submission from Louma’s kitchen in Austrailia. Louma is of Iraqi descent this family dish goes back many generations. Fill a medium saucepan with 6 cups water. I received this newsletter from the farmshare that we are members of and wanted to share some recipes. The Farm is called Enterprise Farms and they are located in Mass. For those of you not familiar with farm shares, it’s a great way to support your local farms while enjoying fresh, delicious veggies from your region. To learn more about Community Supported Agriculture near you, please click on the attached link. The following are three amazing recipes using local fall vegetables. Enjoy! not grown on other farms. Cut the vegetables into large (2-3”) chunks or wedges. Brown the meat in the oil over medium-high heat in a heavy Dutch oven or stew pot. When brown on all sides, remove from pan and set aside. Sauté the vegetables in the fat that remains for about 5 minutes. Add the meat and spices and continue to sauté for another minute or so, then add the broth or water and simmer gently for 1 1/2-2 hours, until the meat can be cut with a fork (or bake at 325 degrees for the same amount of time). Stir gently as to not break the vegetable pieces. Serve hot with couscous. This is a simple soup eaten daily in Portugal in infinite versions. There seems to be a Cape Cod Portuguese-American version as that contains beans and a different type of sausage, linguiça. Either way, the combination of rich potato broth, deep hearty greens and salty pork is perfect for those cold rainy fall nights. Try it with a wine from the Douro region! Saute the onion and garlic in olive oil until translucent, about 5 minutes. Add potatoes and water and bring to a boil. Reduce heat and simmer 25-30 minutes or until potatoes break apart. Puree the soup with an immersion blender, food mill, or some other way. Return to the pan. Wash and remove the tough stems from the kale or collards and stack the leaves on top of one another. Roll them up like a cigar and slice into very fine shreds. (They use a meat grinder-like machine for this at markets in Portugal so you can buy it pre-shredded. It looks kind of like grass clippings.) Add kale to simmering potato broth and cook until tender, about 10 minutes. Serve hot in bowls garnished with the sliced sausage and a thread of high quality olive oil. Every time I enjoy a potato pancake I think of my Grandma Irene and her wooden mixing bowl. I think this recipe from Kitchen Garden Farms would make her smile…. Peel the potatoes and grate into a bowl. Grate in onion and combine. Beat the eggs well and add to the mixture. Add the flour, salt and pepper and set aside. Heat the oil in a deep-sided skillet until very hot, but not burning. Drop about one heaping tablespoon of the mixture carefully into the oil. As the latkes begin to fry, take the back of the spoon and flatten them slightly into “silver dollar” shapes. Turn them once or twice, so that each side fries until it is a golden brown. Remove from the oil and drain onto to a paper towel. Serve hot, with dollops of applesauce and sour cream. In a large pot, mix ingredients together, cover, and cook over low heat until apples are very soft, 20 to 30 minutes. Remove cinnamon sticks, if using. Cool and press mixture through a food mill or sieve to remove peel. The sauce will be a beautiful pink color. This recipe was submitted by a dear friend who is currently working in Palestine. In the time that I have known her, she has offered me the love and wisdom usually afforded only to family. We met many years ago, at a divey hotel in Notting Hill. Seeking solace from bedbugs and fawn eyed boys, we became fast friends and explored London together. For many years we have experienced the charms and losses that accompany growing up. We have reunited in many places around the world, often with great news of the future, or a broken heart, or a newfound cherished love. She is currently working with the Swedish, Israeli and Palestinian governments, in the hopes of restoring some peace and order to a ravaged land. This recipe is from her Mother. A woman of Iraqi heritage with the most beautiful eyes. I have never met my friend’s mother, but I honor her because I know she has produced beautiful, caring daughters who are trying to give back to the world…. Soak the chickpeas in water from the evening before start cooking (aprox 8hours). Grind the chickpeas in a grinder/ mixer until very finely minced. Place the mix and all above ingredients, minus the oil, in a large bowl. Mix well using your (clean) hands and then cover the bowl with a towel and leave for aprox 30minutes. When the time is up, wet your hands and make small croquettes with your hands. When the whole mix has been made into small croquettes, then they’re ready to fry. Put oil into a frying pan and heat up for 5 minutes. Fry the falafel until brown, and then turn to fry the other side until brown. Place a serviette on a large plate and put the fried falafel on the plate, the serviette will then absorb the excess oil from the falafel. Serve falafel on Arabic bread and hummus, tabbouli, fresh cut up tomato and onion. 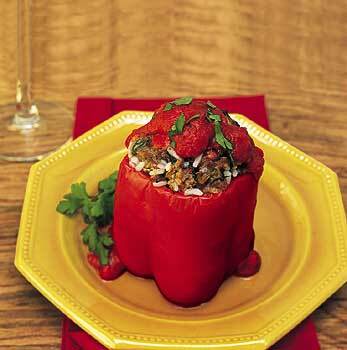 Veggie Vixen’s vegan stuffed peppers….say that fast 10 times! I thought I’d pass it along…. (or water)- that’s for you , not the recipe. water. Bring to a boil..
Add remaining veggies and stir occassionally. and yummy, remove from heat. mixture into the fresh peppers. top. No longer vegan mind you! cal, high fiber dish that your insides will love. This is a play on traditional ratatouille, using delicate chinese eggplant, and fresh cilantro! Deee-lish! Last week’s farmshare brought these cute little eggplant, cilantro and zucchini to our kitchen. My challenge was to use only what I was given, and what was in the pantry. I researched some traditional recipes for ratatouille and improvised. It was absolutely wonderful! 4 small eggplant , cut in medium chunks (the Chinese ones have a purple striped skin and are sweet and luscious. Small Italian eggplant are also a good choice). *Cut all your veggies and set aside. Sprinkle some salt on the eggplant and the zucchini. *In a frying pan, add 2 tbs olive oil. Saute onions for 5 minutes. Add bell peppers and 1/2 of the garlic ontil peppers softened, about 7 more minutes. Transfer to a stew pot or dutch oven. * Return frying pan to medium heat and add some oil. Add the eggplant pieces and saute about 6 minutes. Don’t stir it too much of the eggplant gets mushy. Now add the eggplant to the stew pot. *Now saute the zucchini slices in the empty frying pan about 4-5 minutes until they soften. Add to the stew pot. *Take the can of tomatoes, remaining garlic, cilantro and some fresh ground pepper and add it to the stew pot. Simmer on medium heat about 25 minutes. (Personally, I love flavors to settle and blend, so I simmered on a slightly lower temperature for about 40 minutes). Enjoy! Let me know if you like it! Calling All Vixens! We Want Your Recipes!